This is the headstone of Elizabeth, the wife of Charles POCOCK. Elizabeth POCOCK, nee Gratland, died 1st May 1968 aged 77 years. She lived at 83 Mary Street, Cilfynydd, Pontypridd. Charles and Elizabeth had married at Pontypridd, Glamorgan in 1910. 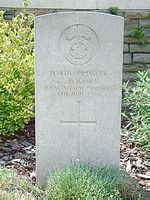 The plot also includes the grave of their daughter Violet POCOCK who died 6th March 1936 aged 23 years. Charles POCOCK is buried in France, but his connection to Nelson is the memorial to him on the headstone of his wife and child. 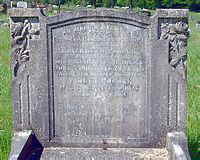 This grave is in St Mabon’s Cemetery, Llanfabon, Nelson. Charles Pocock was one of at least ten children born to Charles and Anna Pocock(nee Dampier). Charles father was born in about 1842 in the parish of Stoke St Gregory, Somerset. Anna was born in around 1844. Charles was listed as a boatman on 1881 census. He died in 1886. Anna died in 1912. Charles - was born in 1887.